Being able to communicate on the social media is not a prerequisite for being a chairman of a Football League club. If it were one would wonder how many of them would have a clue about where to start. They could do worse than take some lessons from David Sharpe. Since taking over a Wigan Athletic at a low ebb in early March it has not been an easy ride for the young Latics chairman. He kept faith in manager Malky Mackay for a month before sacking him and bringing in Gary Caldwell. Could the youngest chairman and youngest manager in the Football League keep Latics in the Championship? Sadly it was not to be. With hindsight we can maybe say that it was a month too long. If Mackay had gone earlier? Relegation was to take a heavy toll and meant that the club had to drastically downsize its operations. Within a space of three years the club was to reduce its budget from around £50m to around £10m. It was an uphill task for the young duo. However, Sharpe has stayed buoyant and positive throughout. The club had lost its way. An era of unprecedented success had led to a freefall where the brakes just did not seem to work. Sharpe went through some tough times, but his capable use of the media was to provide fans with hope for the future. Sharpe is typical of his generation in being comfortable with the social media, but he has also shown himself to be adept at dealing with television and the press. He comes across as being bright, positive and eloquent. In his first media interview following the announcement that he was to be taking over from his grandfather, Sharpe managed to achieve a balance between recognising Dave Whelan’s fabulous achievements and letting us know that he was first and foremost a fan, but that he had not only ambitions to get the club back to where it had been, but had plans on how to do it. The academy plans are currently on hold due to the cost of developing the Charnock Richard facility given current revenues. However, Sharpe recently showed business acumen by purchasing Bolton Wanderers’ training ground at Euxton for a knock-down price. Sharpe’s efforts at reforming the recruiting process has led to Latics making bargain signings of players who were out of contract or getting close to it. They have formed the basis of a squad that is challenging for automatic promotion. He has also been willing to splash up big money, paying up towards £1m for Will Grigg, Reece James and Yanic Wildschut, all of whom are young with the potential to be key players for the future or could be sold off at a good profit. On the reverse side, there was a major outflux of players in summer who were on Championship salaries, plus a couple more in January. The bottom line is that Latics now have players who are willing to give their best for the club, a far cry from the seeming apathy of last season. Whether Latics get promoted this season remains to be seen. But Sharpe stuck his neck out in making an inspirational appointment of a rookie manager in Gary Caldwell and it has been a success up to this point. Good football has returned after a period in the wilderness. Should Caldwell continue in his present vein Sharpe will be hard-pressed to beat away offers from other clubs. Sharpe will be the first to admit that the positive changes at the club are the work of a team approach. Caldwell, Jonathan Jackson, Matt Jackson, the recruitment team, the coaches plus all around have changed the direction of the club. But as chairman, Sharpe sets the direction and the tone. He also takes the flak when things don’t go according to plan. Just three weeks ago the DW pitch was wrecked after a televised rugby match ruined what remained of a pitch suffering from climatic conditions and regular football use over recent months. Sharpe immediately acted upon it, getting a new pitch installed within a week, at considerable cost.He knew that a failure to do so would have been a serious threat to Latics’ promotion hopes, give their possession style of play. It has been a gesture well received by the fans. When Dave Whelan stepped down we were not sure about what would happen next. How could anyone step into his formidable shoes? Sharpe was very much an unknown quantity at the time. David Sharpe certainly deserves credit for the direction he has already given the club during his brief tenure which is approaching a year. One can only hope that the Football League’s youngest chairman can come close to equalling the achievements of his grandfather over the coming years. 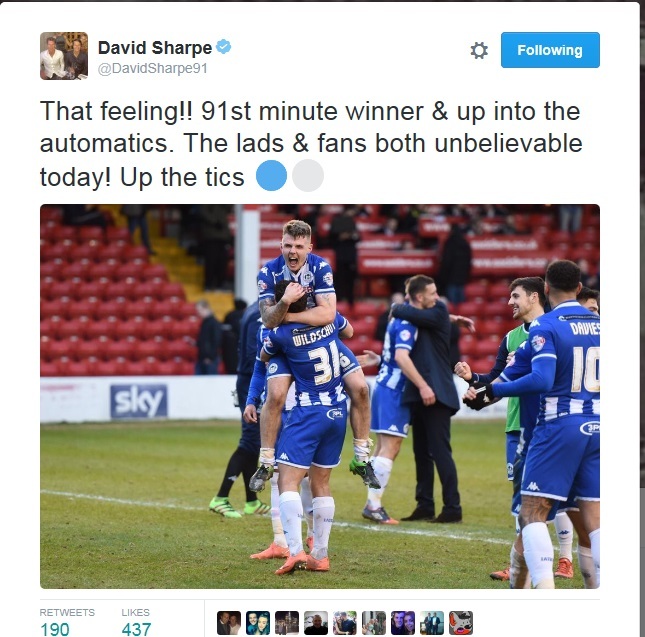 One can’t help but have a good feeling about David Sharpe. His grandad was much more distant from the fans, rarely attending an AGM for example, while Sharpey has attempted to build bridges with us, not only via social media but by attending the fans’ forum and listening to the concerns of fans after the debacle of last season. He is a genuine supporter, steeped in the history of the club and seems absolutely committed to doing the best for Wigan Athletic. However, it will be interesting to see how successful his reforms are when we are again competing against richer clubs already doing many of the things we have latterly changed. More innovation and reform may well be needed if we are to carry on being competitive. Well said, NWL. Who knows what will happen if we get back to the Championship?